Jio is giving a lot of offers and benefits to cricket lovers in India. Where everyone is enjoying IPL matches, Jio is providing more data and good speed to continue the enjoyment of its users. Recently, Reliance Jio has unveiled a new cricket-based offer which is called Jio Phone Match Pass offer. Using this new Jio offer, users can earn more data by referring Jio Phone to their friends and family. 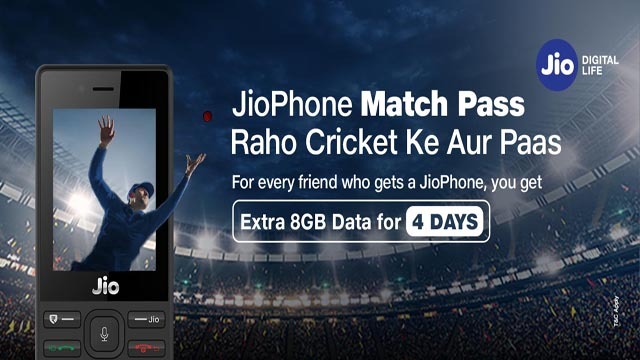 So, in this article, we are going to talk about Jio Phone Match Pass offer and how to participate in this offer to get 112GB of high-speed 4G data for free of cost from Reliance Jio during the IPL match. 1.2 How To Refer Friends To Get Free Data From Jio Phone Match Pass Offer? Jio Phone match pass offer is basically a referral program of Reliance’s Jio Phone. Under this program, users can avail additional data benefits by referring Jio Phone to their relatives, friends, family members and other people. Under this Jio Phone match pass offer, users will need to tell others to buy Jio Phone by submitting their unique Jio number to the Jio toll-free number 1800-890-8900. And when the new Jio Phone connection is active, Jio will credit data for free to both. Below, you can see the benefits of referring others to get a new Jio Phone based on the number of users you refer. If you can refer 4 persons to get Jio phone, you will get 8GB data with 4 days of validity and with 2GB of daily cap. Once you refer the 5th person, 24GB data at 2GB daily cap with 12 days validity will be provided as a bonus. For referring between 6th to the 9th user, you will get 8GB data with 2GB daily cap for 4 days for each refer. If you can refer 10 persons, another 24GB data plan with 12 days of validity will be credited to your account. Daily limit of data is 2GB a day. Now, you might be thinking, why users will get Jio Phone with your referral. Well, Reliance Jio has also thought about it and to boost the whole referring process, Jio is crediting 8GB of high-speed 4G data at 2GB daily FUP limit for 4 days to the person who has got Jio Phone using your referral. How To Refer Friends To Get Free Data From Jio Phone Match Pass Offer? Tell the person whom you are referring to dial 1800-890-8900 and mention your Jio number. Then he/she will need to provide the local area pin code. Once the booking is done over the phone call, the user can get a new Jio Phone from their nearest Jio Digital store. That’s just it. Both you and the person you referred will receive rewards according to the reward list given above. But make sure that, when the person is getting the Jio Phone from the retailer, he/she uses the number during the e-KYC process which has been used previously to call on 1800-890-8900 at the time of booking Jio phone over the phone call. This will help Jio to identify and validate the whole referral done by you! Otherwise, if they are unable to validate the referral, both of you will not get any benefit.